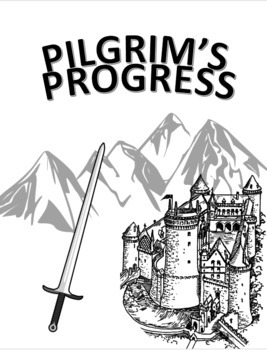 This packet gives you questions for every chapter in Pilgrim's Progress: John Bunyan's Classic Story Adapted for Children by Anna Trimiew. 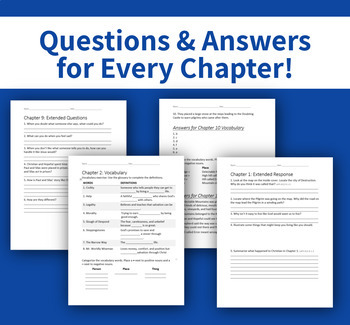 • Printable worksheets with comprehension questions for every chapter. • Vocab worksheets (matching, fill-in-the-blank, and sorting) for every chapter. • Answer key for the vocab and comprehension worksheets. • Applicable Common Core standards included throughout. Note: There is not an answer key for the extended question worksheets, as the answers for those questions will vary. This product contains both the Word file and the PDF file of the packet. That way you can edit it if you want, or simply print and go! Thank you for rating and reviewing! Please remember to follow my store!